GENERAL WALTER C. SWEENEY JR.
General Walter Campbell Sweeney was commander of the U.S. Air Force Tactical Air Command, which prepares and maintains combat-ready forces capable of conducting worldwide tactical air operations. A native of Wheeling, West Virginia, he was born in 1909. He graduated from the U.S. Military Academy and was commissioned a Second Lieutenant of infantry in June 1930. In October 1934, he entered primary flying school at Randolph Field, Texas, with subsequent graduation from the advanced flying school in October 1935, at Kelly Field, Texas. His first operational assignment was with the Eighth Attack Squadron of the Third Attack Group at Barksdale Field, Louisiana. In June 1939, General Sweeney joined the Fifth Bomb Group in Hawaii and later transferred to the 1lth Bomb Group as commanding officer of the 431st Bomb Squadron. He commanded an Army Air Force Task Group during the Battle of Midway in June 1942. In July 1942, he became the air officer for the Theater Group, Operations Division of the War Department General Staff in Washington, D.C. In July 1944, General Sweeney was assigned to the 73rd Bomb Wing and moved with this unit from Colorado Springs, Colo., to the Pacific area, serving as chief of staff and later deputy commander. While with the wing in the Marianas, he participated in the first unprecedented low-level attack with B-29s against the Japanese. On a later mission he lost his aircraft, paddled ashore in a life raft, and returned to his island base. In July 1945, he became director of plans of the Strategic Air Force, Pacific Ocean Area, Guam. After the war he served as a member of the Joint War Plans Committee for the Army Air Force in Washington, D.C., until July 1946 when he became an instructor at the National War College. In October 1947, General Sweeney was assigned to the Office of the Assistant Secretary of the Air Force, and the following year was named director of plans for the Strategic Air Command with headquarters at Omaha, Nebraska. In April 1953, he was assigned to command the Fifteenth Air Force at March Air Force Base, California. In June 1954, while commander of this strategic bomber force, he led a trio of Stratojets in history's first non-stop flight of jet bombers across the Pacific Ocean. For six years, from August 1955 until September 1961, General Sweeney commanded the Eighth Air Force at Westover Air Force Base, Massachusetts. In October 1961 General Sweeney was promoted to four-star rank and assumed command of the Tactical Air Command with headquarters at Langley Air Force Base, Virginia. General Sweeney has been awarded the Distinguished Service Cross, Distinguished Service Medal, Silver Star, Legion of Merit with oak leaf cluster, Distinguished Flying Cross and Air Medal. He is rated a command pilot. General Sweeney was buried with full military honors in Section 30, Grave 703, Arlington National Cemetery. 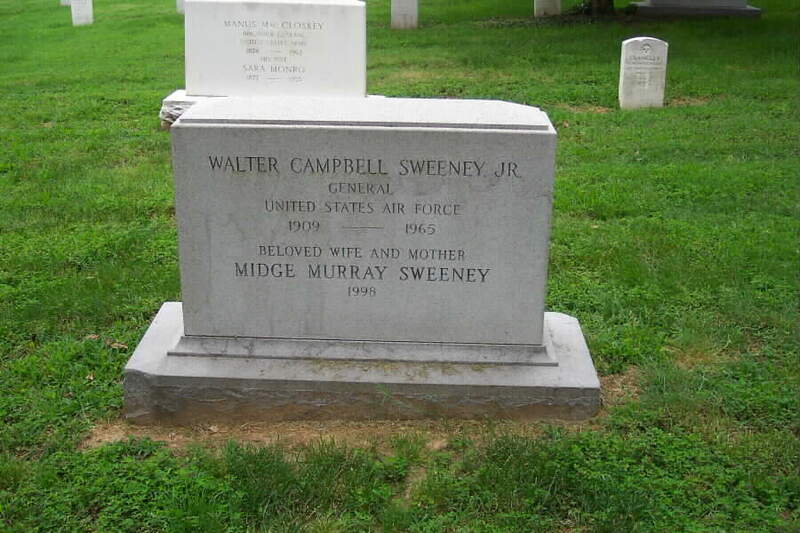 His wife, Midge Murray Sweeney, who died in 1998, is buried with him. The President of the United States takes pleasure in presenting the Distinguished Service Cross to Walter C. Sweeney, Lieutenant Colonel (Air Corps), U.S. Army Air Forces, for extraordinary heroism in connection with military operations against an armed enemy while serving as Pilot of a B-17 Heavy Bomber in the 431st Bombardment Squadron, 11th Bombardment Group (H), HAWAIIAN Air Force, while participating in bombing missions from 3 to 6 June 1942, against enemy targets in the Pacific Theater of Operations. The personal courage and devotion to duty displayed by Lieutenant Colonel Sweeney on this occasion have upheld the highest traditions of the military service and reflect great credit upon himself, the Hawaiian Air Force, and the United States Army Air Forces.